These copyright free fashion images showcase individual pieces of clothing. Unlike our Fashion plates section where we feature entire ensembles often presented as full-length portraits, this section of Free Vintage Art focuses on images of individual clothing items. We’ve included the dates, when known, as well as the original sources of this collection of clothing images. Many come from vintage fashion magazines that women used to design their own wardrobes. Sewing patterns from the 1890s. So in love with the pretty femine styles; so glad I never had to sew my own, Pretty lady’s gown from Butterick with 2 images. 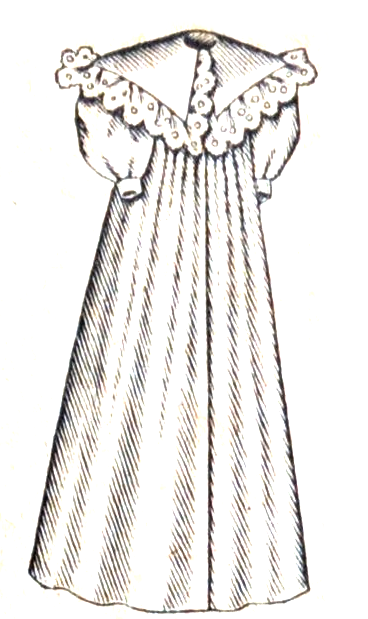 Fashion catalog illustration from 1895 of a dolly cloak design. 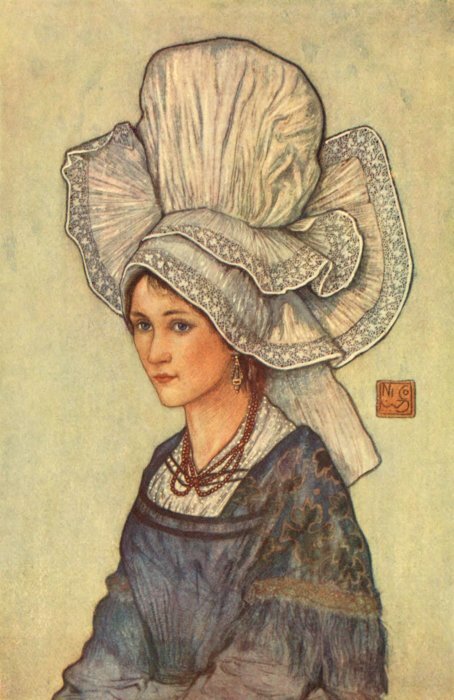 Vintage painting of a beautiful French girl wearing a traditional Normandy cap – an elaborate and tall white hat with yards of lace trim. 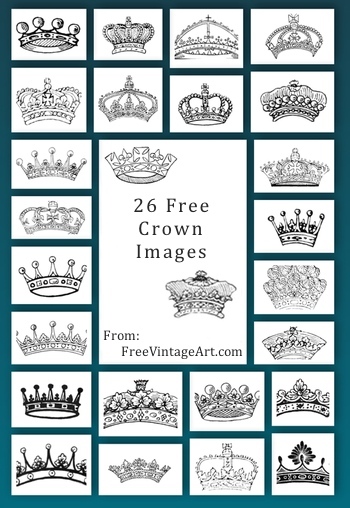 We pulled these 26 crown images from an 1909 book of English heraldic book stamps. They are a little small but can be made bigger. The graduate drawing depicts a male student dressed in a red graduation gown with mortarboard and book. It is in the public domain in the United States. 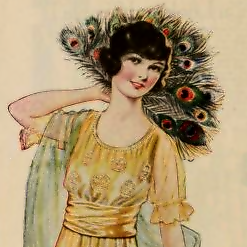 Vintage drawing of a yellow 1920 party dress. 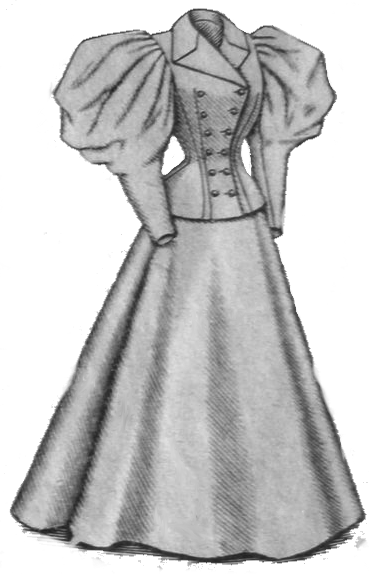 Oh how pretty the dresses were back then – the fashion catalog was full of dress drawings like this one. 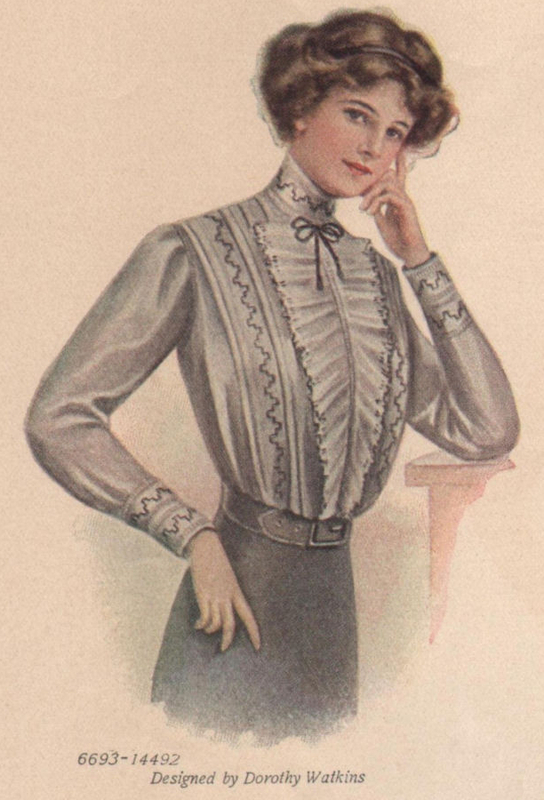 Ladies’ Home Journal fashion image for a shirtwaist pattern. This 1915 image is in the public domain and can be freely incorporated into your own projects. 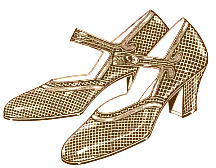 Lady’s dress shoes from the 1920s. The original advertising image along with several color variations. I did a search on Amazon for steampunk graphics to get you started. Maybe you'll find that little something that will transform your current creative project into something spectacular.